The Attic Breeze AB-253D solar attic vent features a remote mounted 25 watt attached solar panel, corrosion resistant zincalume alloy vent housing, ultra-quiet 14 inch fan, thermal switch, and rodent guard. This attic vent will move up to 1550 CFM of hot attic air in full sun exposure. 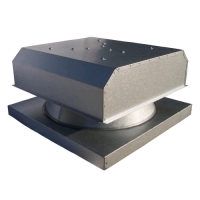 The curb-mount vent housing of the AB-253 and AB-254 models is most appropriate for either tile or metal roofs. The AB-253D solar attic vent is designed for homes that do not have good southern-southwestern sun exposure for the desired attic vent installation location and require the flexibility of a remotely mounted solar panel. This model comes standard with low profile solar panel mounting brackets. Mounting brackets for this model may be upgraded to our fully adjustable universal mounting bracket option. Unit ships with unpainted finish that can be customized to match your home's outside decor.